Weekly Mains Exam 2015 Answer Writing Challenge - Public Administration "MODULE- VI" | IAS EXAM PORTAL - India's Largest Community for UPSC Exam Aspirants. 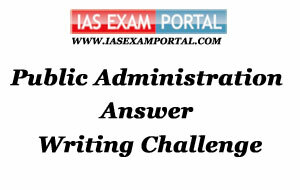 Weekly Mains Exam 2015 Answer Writing Challenge - Public Administration "MODULE- VI"
The main idea behind Weekly Answer Writing Challenges is to make your exam preparation more result oriented. For this exam (UPSC Civil Services), just ‘reading’ is not enough. The most advantageous part of this writing exercise is to make your answer visible to everyone, someone may correct you if they find a mistake in your answer plus it must be also supported by our experts , you may see others answers also. It is free and definitely will improve your writing ability and marks in your final examination. Here all topics from syllabus will be covered. Public Administration- Paper I "Syllabus Topic – Administrative Behaviour"
Indian Administration- Paper II "Syllabus Topic –District Administration"
Write Your Answer in Comment Box.